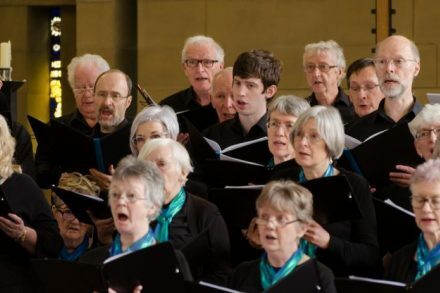 Escafeld Chorale began life in 1969 as a small group of friends, the Fossdale Singers, and has steadily grown over the years (changing its name along the way) into a choir of around 70 singers, while still retaining its friendly atmosphere. From 1983 to 2001, Francis Wells (conductor of Bolsterstone Male Voice Choir) wielded the baton, developing the choir so that it could tackle a wider range of music, from Palestrina, Byrd and Vivaldi, through Mozart, Haydn and Handel to Poulenc, Vaughan Williams and Britten. From 2001 until 2013, Peter Dutton continued to expand the repertoire, with works as varied as Brahms’s Ein Deutsches Requiem, Haydn’s Creation, Orff’s Carmina Burana and Ramirez’s Misa Criolla. 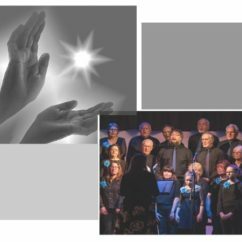 The choir also enjoys singing the madrigals and part songs that formed the mainstay of its early repertoire, and its Christmas concerts are firm favourites with both choir and audience. From 2013 Ian Roberts took over as Musical Director, until he moved on to become director of music at Newcastle Cathedral in summer 2016. He was joined by George Parsons as our accompanist and soloist, who remains with us. We usually perform a major work from the choral repertoire in the spring. Our 2014 concert, featuring Faure's Requiem, plus pieces by several other French composers with links to Faure, was very well received, audience members commenting that it was a stimulating programme, that the sopranos had never sounded so good and that the Faure was 'heavenly'. Our spring 2015 concert was largely devoted to the music of Haydn, primarily his Nelson Mass, and in 2016 we performed Rossini's Petite messe solennelle. Our summer concerts are usually lighter in tone, sometimes around a theme, such as music from a particular country; our final concert under Ian's direction was a successful performance of Purcell's Dido and Aeneas in the summer of 2016. Our search for a new musical director was prolonged, during which Francis Wells agreed to conduct again on a temporary basis. The search was finally rewarded in the spring of 2017 when the post was taken by Nigel Russel. He has already led us in new directions, with a performance of Elgar's Music Makers in the summer. 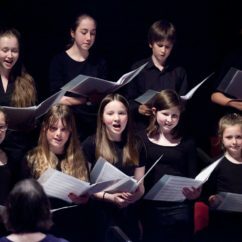 We often perform with local singers and instrumentalists, and are keen to encourage young performers (especially through our Associate Soloist scheme) and to support local charities From time to time we have vacancies in all sections and a friendly welcome is extended to new members. We don’t ask you to undergo an audition but we do expect a certain level of musical ability and there’s a short probationary period.